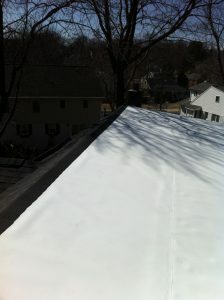 This is standing seam tin roof, probably around 40 years old. During high winds the eave edge of the roof was peeled back and flipped over on itself; the owner did his best to push it back and laid bricks across it to hold it down. 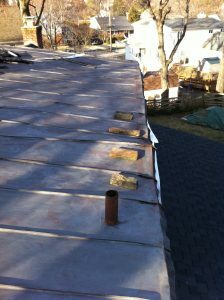 When the panels flipped over it split the metal along the seams, there was really no repair option, the roof needed to be replaced. 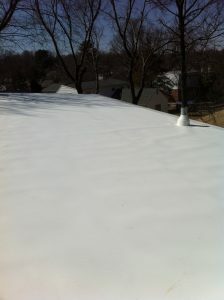 The majority of the roof is a charcoal asphalt shingle, this area was the only one with metal. 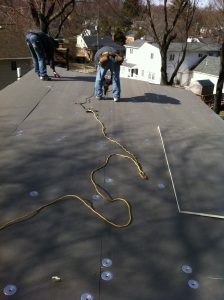 This portion of the roof has a very low slope, too low to replace the metal roof with shingles. 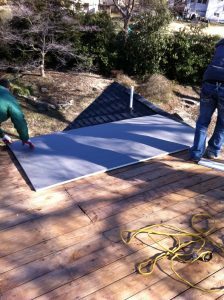 This area is also invisible from the ground so there really wasn’t any reason to install another metal roof. 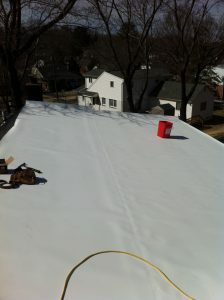 My client chose TPO membrane, TPO is a bright white material that will perform perfectly in this application. The pictures below will take you step by step through the job, click on any to enlarge. 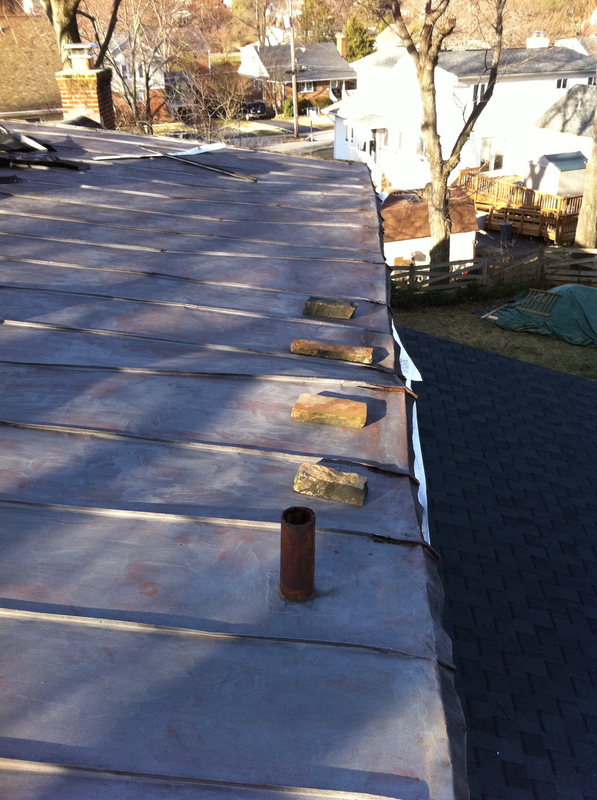 We removed all of the old metal roofing and found that the roof decking was all in great shape. 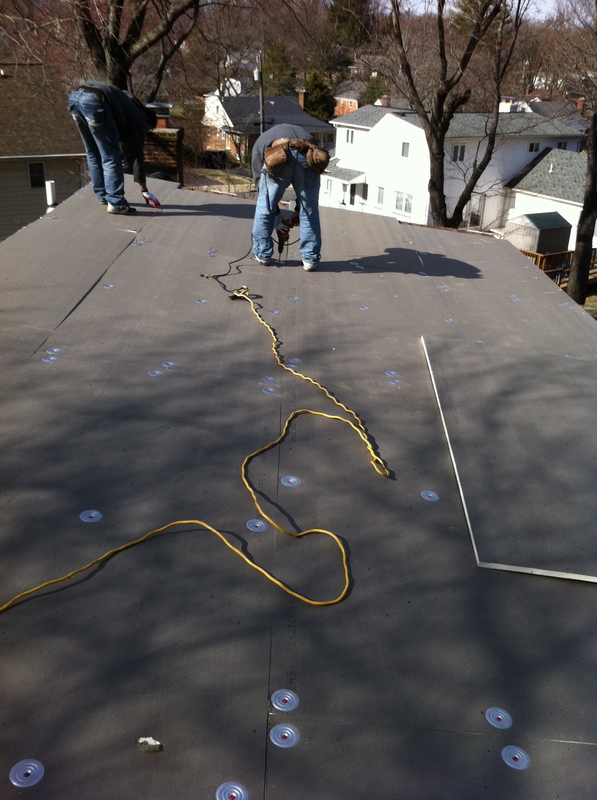 The panels you see being laid out is 1″ thick polyisocyanurate rigid insulation board; it has two functions, first it protects the roofing membrane from the rough bumpy roof deck and it also provides good R-value. We fastened the insulation board with plates and screws, the round silver plates act almost like washers, giving more surface area for the center screw to clamp the insulation tightly to the roof. TPO membrane comes in a variety of widths to suit most common applications. 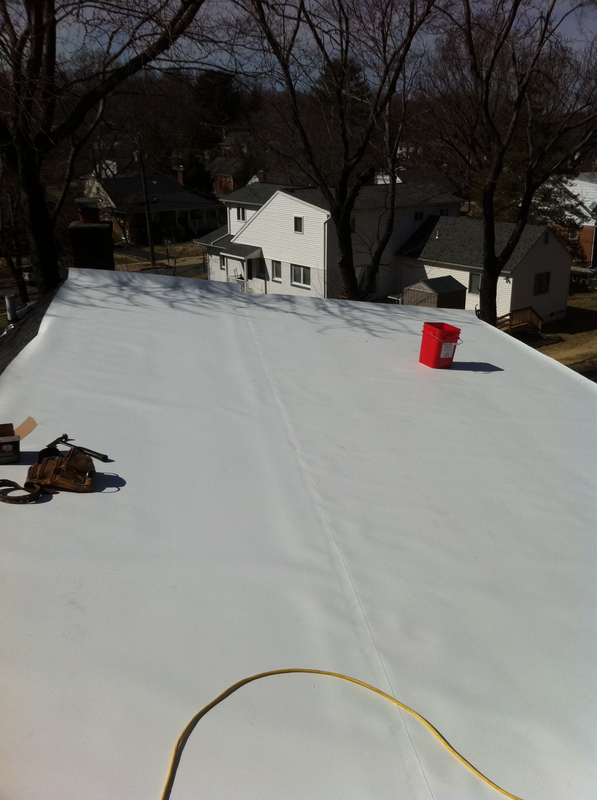 To keep seams to a minimum we chose a 10′ x 100′ roll of TPO; it is secured to the roof with screw and seam plates; these are smaller than the insulation plates but perform the exact same function. 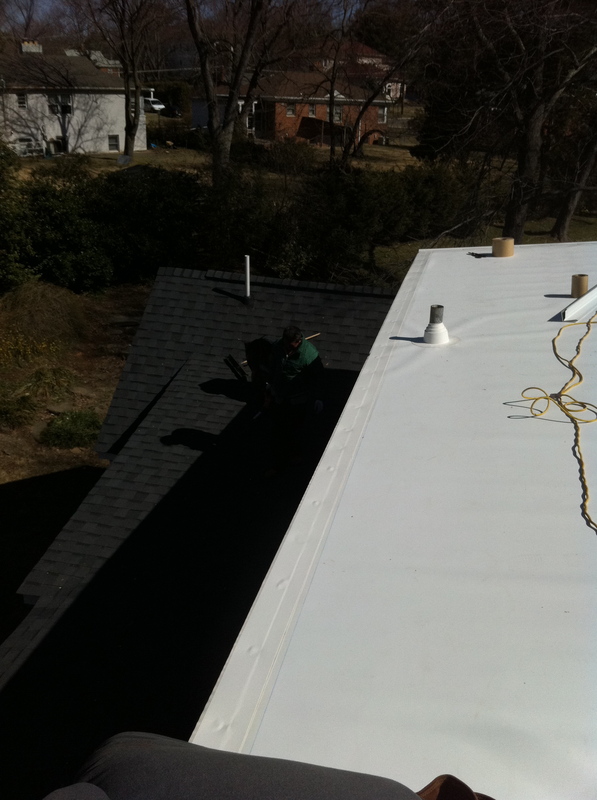 The second course of TPO is installed and the overlap is welded with a hot air welder; once welded the seam is as strong as the field of the membrane. 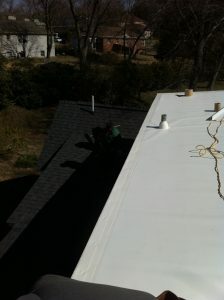 This seam requires no glue, no caulk or sealant and no maintenance. The edges of the roof are secured with drip edge, it’s an L shaped piece of painted aluminum that waterproofs the roof edge and secures the membrane at the perimeter. 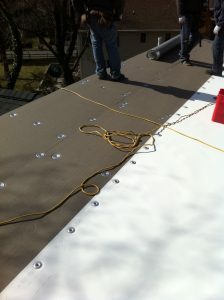 You can also see a TPO pipe flashing installed and welded to the membrane. After the drip edge is installed we cover the fasteners with white TPO cover flashing. 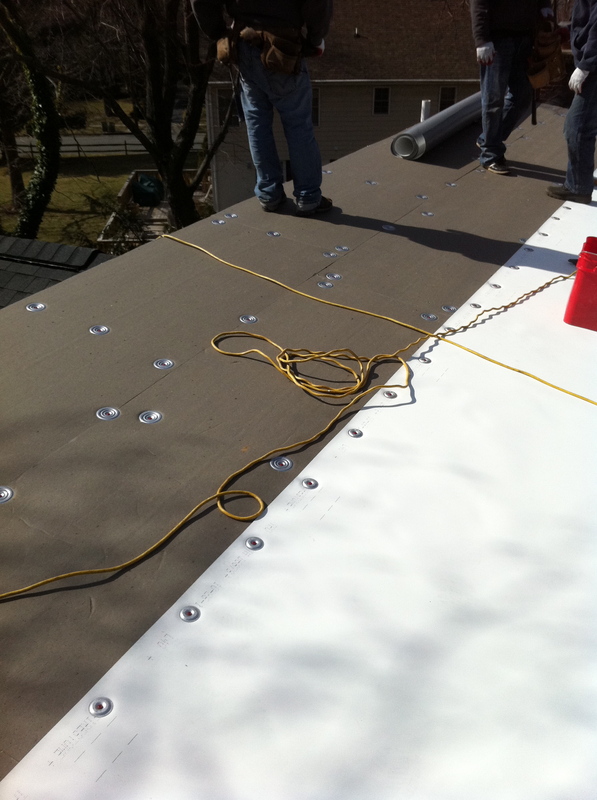 This entire roof system is designed to overlap and enclose all exposed fasteners, this will make a roof virtually maintenance free. 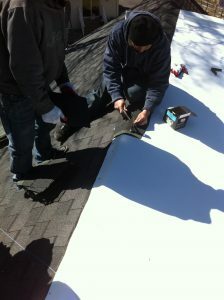 We use matching shingle ridge caps at the peak of the roof, this will look perfect from the street. 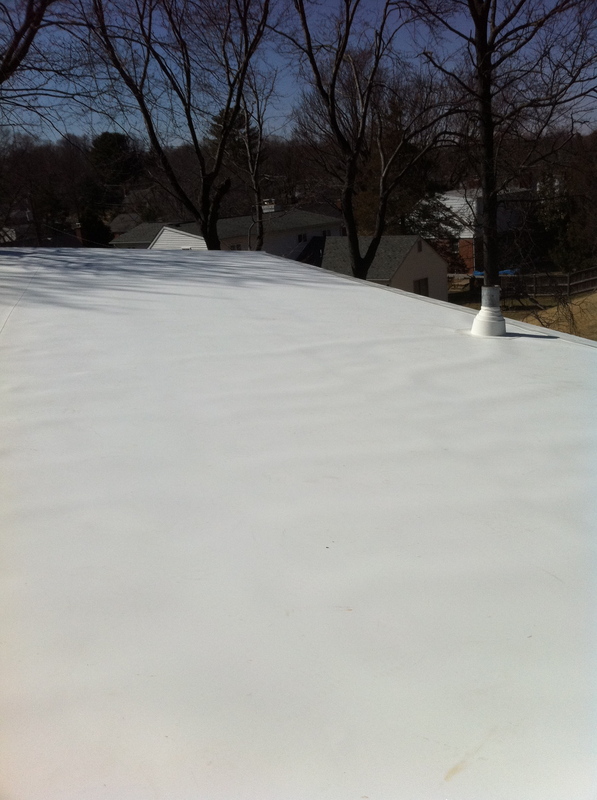 All done; this roof will provide good service for a least 20 years with minimal maintenance from the owner. 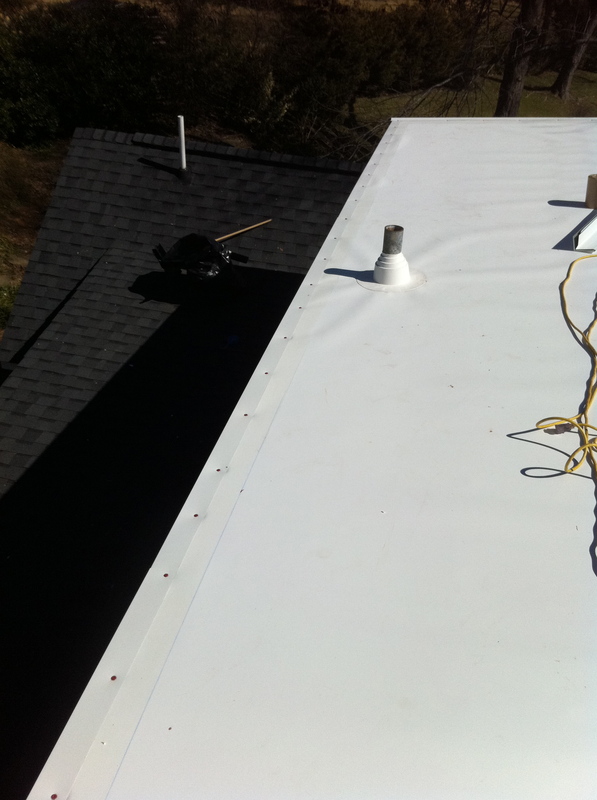 The bright white membrane surface and insulation board will also keep the upper floor cooler in the summer and a little bit warmer in the winter.